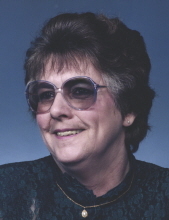 G. Arlene Hill, 76, of Fostoria, passed away at 10:16 am Wednesday October 24, 2018 at the Bridge Hospice Care Center, Findlay. She was born December 21, 1941 in Wood County, Ohio to the late Leonard and Evelyn (Mapes) Beair. She married Ned M. Hill on September 11, 1960 in Risingsun and he died February 5, 1991. Surviving are six children, Tammy J. Rasp, Mt. Vernon, Theresa J. Welly, Englewood, FL, Tina M. (William) Cook, Fostoria, James A. Hill I, Fostoria, Gary M. (Cathy) Hill, Bluffton and Melissa A. (Richard) Blechinger, Howard; 19 grandchildren, Jennifer K. Gunder, James M. Rasp, Lindsay A.M. Hartsel, Lucas A.M. Hartsel, Lauren A.M. Hartsel, Abigail E. Welly, Ashley L. Jones, Lance B. Cook, Heather L. Ingling, James A. Hill II, Toni R. Salgado, Lee M. Hill, Lacey S. Evans, Mackenzie L.M. Blechinger, Briar A.G. Blechinger, Bricen M.G. Blechinger, Wyatt R.J. Blechinger; and 25 great-grandchildren, Benjamin J. Gunder, Seth A. Gunder, Elizabeth A. Gunder, Rebecca L. Rasp, Anthony M. Rasp, Michael Thomas, Grace K. Bennett, Zander Mompher, Kaiya J. Mompher, Brantley J. Rasp, Jace P. Rasp, Charlotte E. Cook, Chloe L. Ingling, Mia E. Ingling, Reese A. Ingling, Harley J. Brown, Axel L. Hill, Abrielle E. (Hill) , Zendaiah L. Scott, Ryan A.A. Blechinger, Annabelle A.N. Blechinger, expected boy Weston A.L. Blechinger. She was also preceded in death by a granddaughter, Heidi Ann Hill; and two sisters, Norma L. Walters and Patricia Ann Beair. Arlene was a homemaker who loved spending time with her grandchildren and family. She enjoyed animals, fishing, dancing, playing cards and crocheting. Visitation is Sunday October 28, 2018 from 2-4 & 6-8 pm at HOENING & SON FUNERAL HOME 133 W. Tiffin Street, Fostoria and one hour before the funeral Monday. Funeral service is 11 am Monday October 29, 2018 at the funeral home. Burial will follow in Fountain Cemetery, Fostoria. Memorials are suggested to the Seneca County Humane Society, American Heart Association and American Cancer Society. To send flowers or a remembrance gift to the family of Gwendolyn Arlene Hill, please visit our Tribute Store. "Email Address" would like to share the life celebration of Gwendolyn Arlene Hill. Click on the "link" to go to share a favorite memory or leave a condolence message for the family.